What? Pancakes on a diet? Yesterday, I talked about cheating and how sometimes you can make a meal that is a cheat, but technically NOT. So, today, I am sharing with you a picture of my CHEAT for Thursday. Lindora pancake mix. 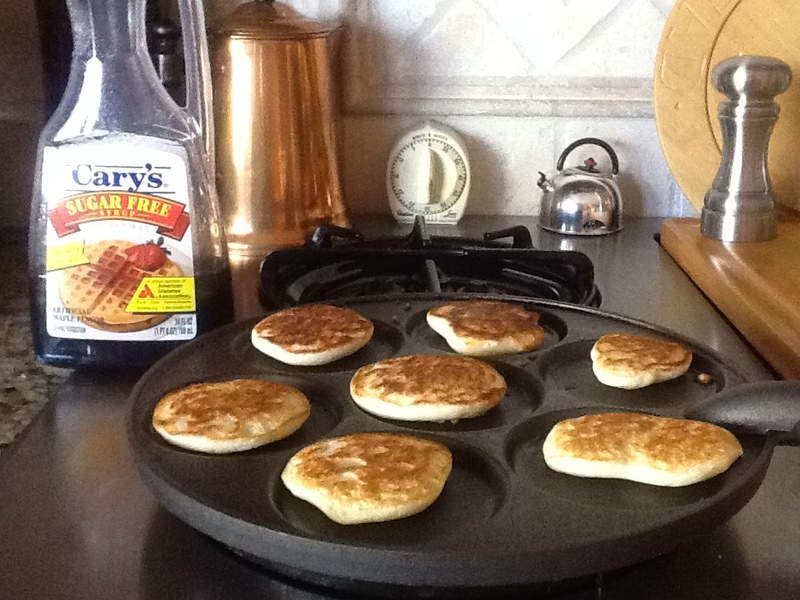 12g of net carbs for what you see in the picture, with lite syrup that is 1g of carb for 1/4 cup. I barely used two tablespoons. HOWEVER, if I had used regular maple syrup at about 50g of carbs per 2 tablespoons, I would have ruined my diet for the day for sure! Same amount of pancakes with regular mix is about 33g of carbs, so almost triple what these have. So, I had a tiny bit of butter on my cakes, they were low-carb and low sugar cakes and sugar free syrup. (look on labels, some of the low sugar syrups are still high at 20g of carbs per 2 tablespoons. That is not low, just half of regular syrup. So, buyer beware. Compare! There are some good sugar free syrups out there. Makers of those include the one in the picture, Cary’s, Log Cabin has one, Mrs. Butterworth makes one and Walden Farms. If I ate regular cakes with regular syrup, instead of having about 13g of net carbs for my meal, I would have been eating for the cakes and syrup, 33+50 (two tablespoons)=83g of carbs. 13g vs. 83g of carbs. See why this could be seen as a cheat, but it isn’t!? They tasted JUST as good to me and I saved 70g of carbs. That could have caused me to not lose weight for the week. You can also find low carb pancake mixes on websites like Carbessentials.net and Netrition.com, and even Amazon. Just Google it!